Microorganisms control the composition of our atmosphere. They consume and produce various climate-relevant trace gases through metabolic processes. For example, soil bacteria consume over 300 million tonnes of hydrogen and carbon monoxide from the atmosphere each year — they scavenge these gas using high-affinity metalloenzymes and use them as alternative energy sources for persistence. Other microorganisms regulate the levels of methane and carbon dioxide in the atmosphere. We have collected evidence that scavenging of atmospheric trace gases is widespread among microorganisms. We are now performing interdisciplinary studies to better understand the biochemical basis, physiological role, and ecological significance of trace gas scavenging and other gas-cycling processes. The knowledge is being used to help predict and mitigate greenhouse gas emissions. We have shown that dormant soil microorganisms consume atmospheric hydrogen and carbon monoxide as reserve energy sources. In addition, we have resolved the organisms and enzymes responsible for this process (PNAS 2014a, PNAS 2014b, PNAS 2015, Nature 2017, ISME 2019). We have also reveal unprecedented metabolic capabilities of the bacteria that mitigate methane emissions (ISME 2017). Figure: Phylogenetic trees of hydrogenase protein sequences across microbial taxa. 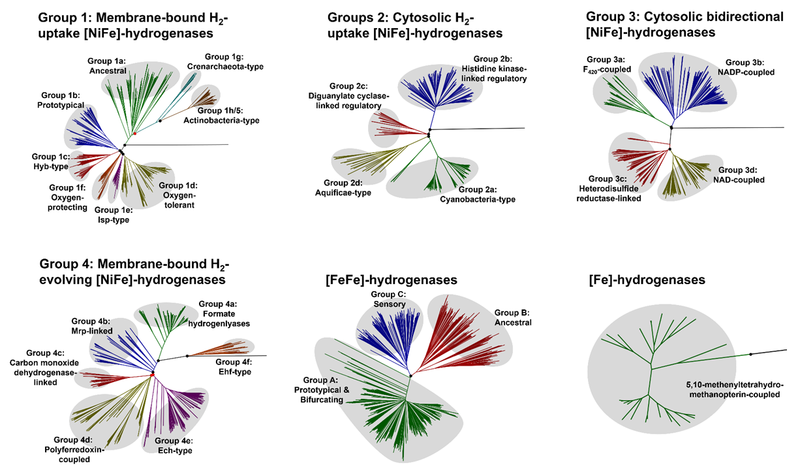 This demonstrates that the enzymes that mediate the oxidation and evolution of H2, are highly phylogenetically diverse, functionally versatile, and taxonomically widespread (ISME 2016). More generally, we have shown hydrogen metabolism is ubiquitous across microbial taxa and different ecosystems (ISME 2016, SREP 2016). This metabolism profoundly influences biogeochemical cycling in various systems, including coastal sediments (Nature Geoscience 2017; Nature Microbiology 2019), geothermal soils (ISME 2017b; ISME 2019), and gastrointestinal tracts (Gut Microbes 2016; ISME J in review).